I just moved to Forest from Denver, Colorado with my family and the scenery is unbelievable. I have been out on a couple of rides and I don’t know which is better, the view or the wonderful roads without traffic. I have to admit, navigating here has been a bit more challenging than I thought and I was looking to see if anyone would take me out to show me some great roads to ride. I can reached best via email; tcarraway7hl@yahoo.com. Thanks for your consideration. Welcome to Blue Ridge country! The mountains here in the east don't compare with the grand Rockies of Colorado, altitude-wise, but it's not the size that counts. If you've had a chance to poke around on the forum, you already know that the Blue Ridge Beemers typically meet for a "1st Sunday" breakfast and ride each month, but things have not been typical lately... Actually, come to think of it, atypical is typical around here. Right guys? In any case, give a shout out on the forum when you want to go for a ride. There seems to be a bunch of lurkers on here nowadays (hi Big Chris!) but don't be shy--just pick a date/time and propose a meeting location or route. If you post it they will come. Usually. If you decide to take a ride up north a ways or want to explore some back roads in my neck of the woods (Albemarle/Green/Orange/Madison counties), send an email to me at MTSweger@hotmail.com and we'll figure out a good place to meet. Although most of our summer riding tends to be across the valley and into West Virginia, there are plenty of excellent roads on this side of the mountain too. Am not new to VA but just bought my first BMW R1200RT a month ago. Happy to do day trips with folks around Charlottesville. happy to see there is a BMW group, I seem to only see Harleys! I live in the Gladys area which is about 18 miles south of Lynchburg. 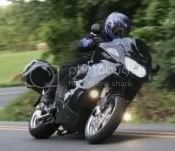 I will let you know when my ridding partners are planning a trip or a day ride. You will be more than welcome to join in on the fun. I ride all year so short trips are also alot of fun when it is cool.